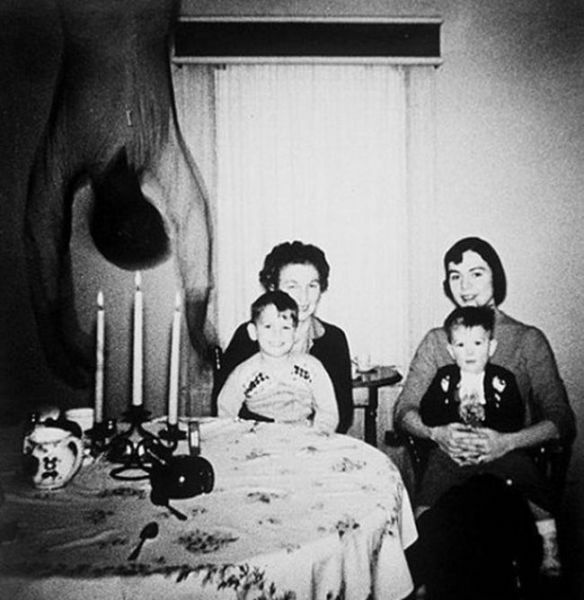 As the Cooper's move into their new home in Texas, they take a photograph of the family sitting together, but as the photo is taken, a body falls from the ceiling. The OP said he wasn't sure if it was real, but he thought it was real creepy. 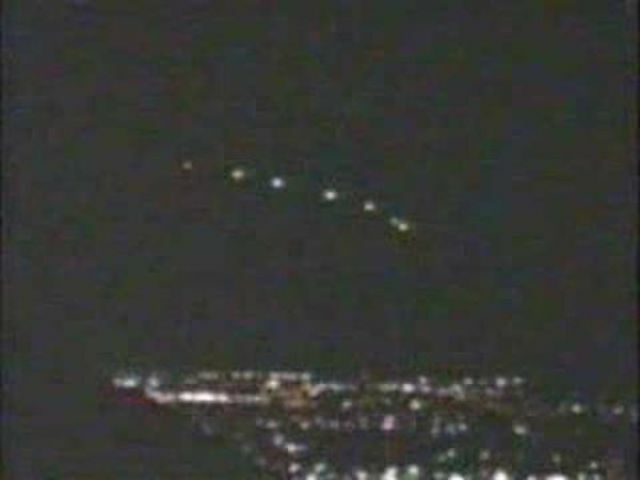 The Phoenix Lights were a series of widely sighted unidentified flying objects, seen by 1000s of people, observed in the skies over Arizona, Nevada in the United States, and Sonora, Mexico on Thursday, March 13, 1997.There were allegedly two distinct events involved in the incident: a triangular formation of lights seen to pass over the state, and a series of stationary lights seen in the Phoenix area. The United States Air Force identified the second group of lights as flares dropped by A-10 Warthog aircraft that were on training exercises at the Barry Goldwater Range in southwest Arizona. 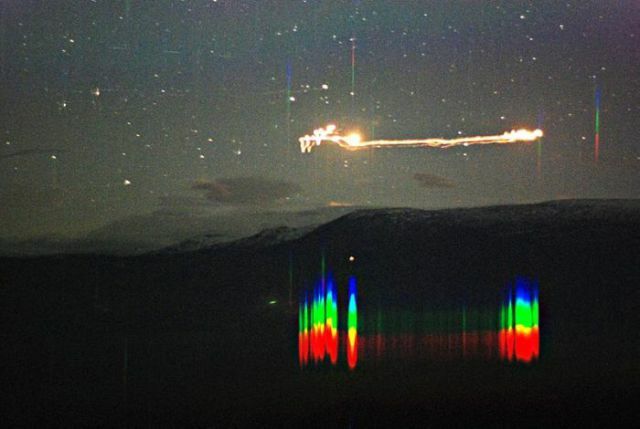 The lights were reported to have reappeared in 2007 and 2008, but these events were quickly attributed to (respectively) military flares dropped by fighter aircraft at Luke Air Force Base and flares attached to helium balloons released by a civilian. 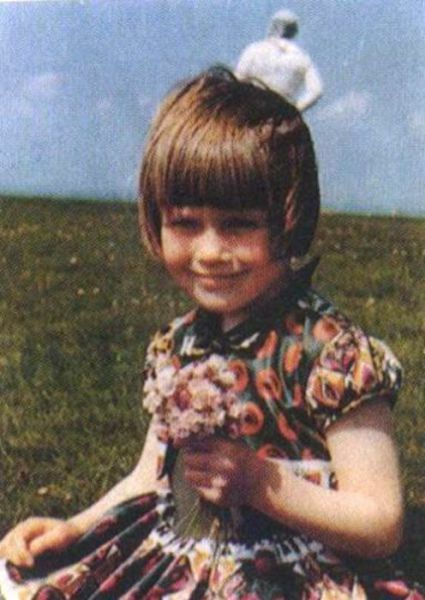 Jim Templeton was in a marsh taking photos of his young daughter and after getting them developed there appeared to have been a Spaceman in full astronaut gear standing behind her. Except there wasn't anyone else around while they were there. Even Kodak verified that it was not tampered with. 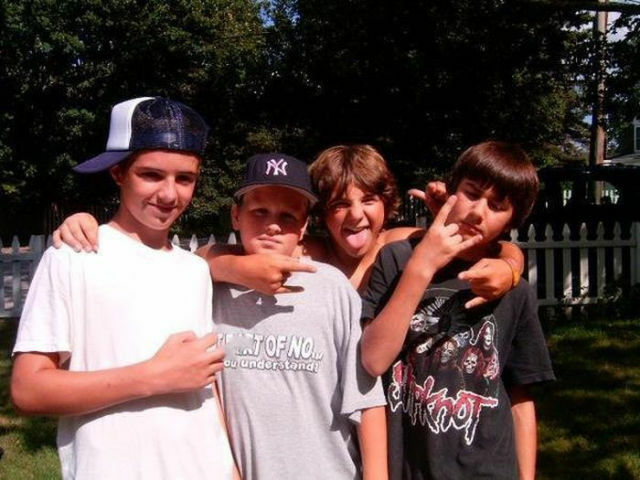 A group of four kids posing for a picture, however, there appears to be a mysterious thumb next to the kid in black on the right, that does not seem to align with anyone's body. The OP of this photo says he has no idea where the thumb could have come from. 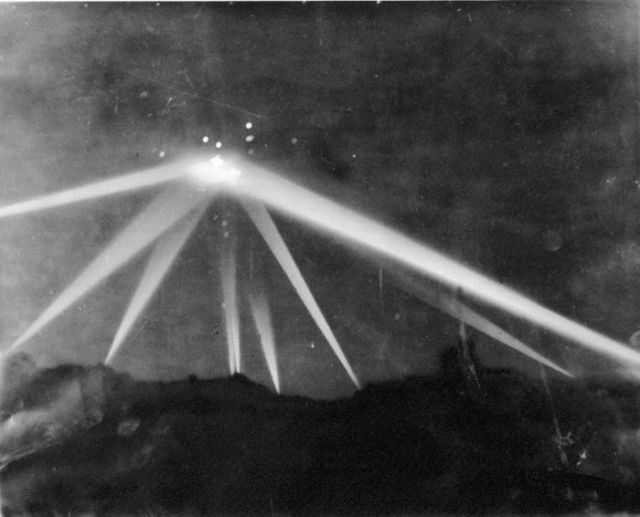 A photo published in the Los Angeles Times on February 26, 1942 has been cited by modern day conspiracy theorists and UFOlogists as evidence of an extra-terrestrial visitation. 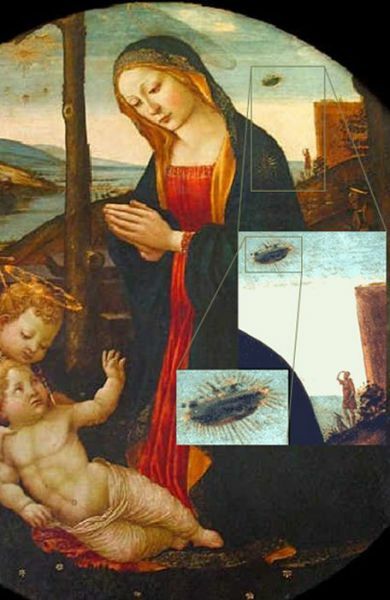 They assert that the photo clearly shows searchlights focused on an alien spaceship; however, the photo was heavily modified by photo retouching prior to publication, a routine practice in graphic arts of the time intended to improve contrast in black and white photos. Los Angeles Times writer Larry Harnish noted that the retouched photo along with faked newspaper headlines were presented as true historical material in trailers for the film Battle: Los Angeles. 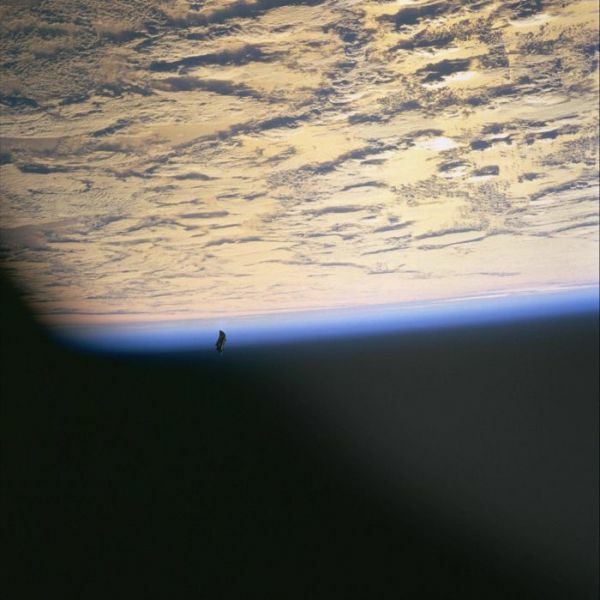 Harnish commented, "if the publicity campaign wanted to establish UFO research as nothing but lies and fakery, it couldn't have done a better job." 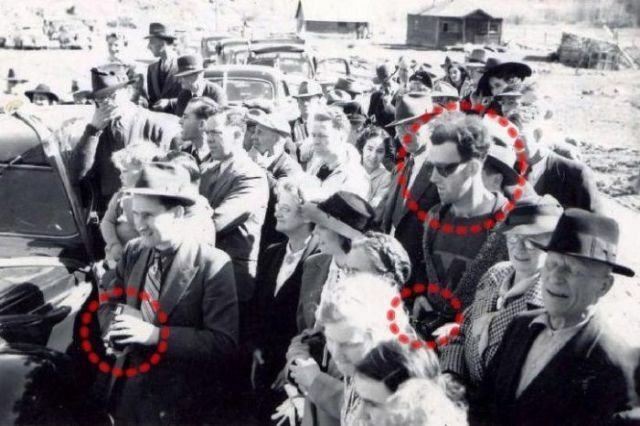 People believe that this photograph, taken in 1941 at the re-opening of the South Forks Bridge in Gold Bridge, Canada, is depicting a man in seemingly modern dress and style, with a camera that is advanced well beyond its time. The circle on the left illustrates a man with a camera typical to the time-period. 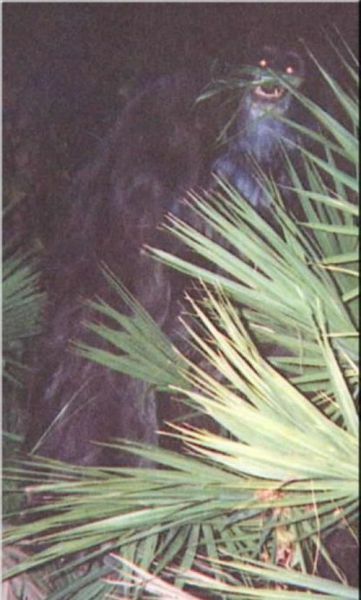 In 2000, two photographs said to be of the Skunk Ape were taken by an anonymous woman and mailed to the Sarasota County, Florida, Sheriff's Department. The photographs were accompanied by a letter from the woman in which she claims to have photographed an ape in her backyard. The woman wrote that on three different nights an ape had entered her backyard to take apples left on her back porch. She was convinced the ape was an escaped orangutan. The pictures have become known to Bigfoot enthusiasts as the "skunk ape photos." 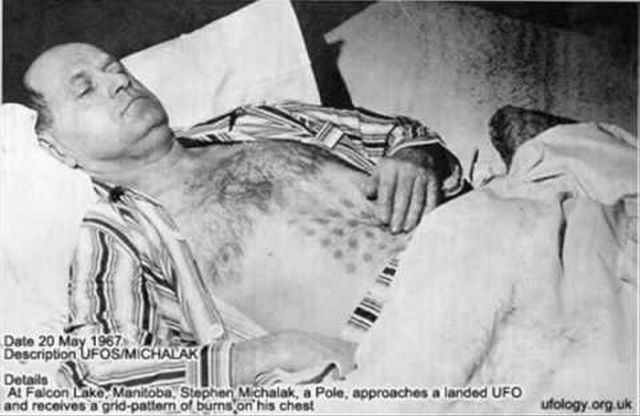 The Falcon Lake Incident is a reported unidentified flying object (UFO) encounter near Falcon Lake, Manitoba, Canada claimed to have occurred on May 20, 1967 by Stefan Michalak. He had had taken a short vacation in Whiteshell Provincial Park to prospect veins of quartz near Falcon Lake when he spotted two cigar-shaped objects descending, one of which landed near him. Michelak says he saw a door open and heard voices from inside the object, after which he tried to make contact in English and other languages but got no response. He claims to have burned his hand while attempting to examine "colourful glass" found around the object and seen a grid-like exhaust vent that expelled gas that burned his clothing. 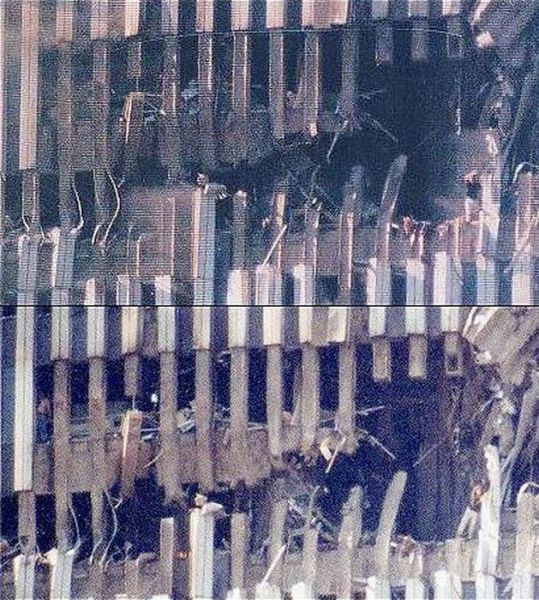 #9- In the top left of the 2nd photograph there appears to be a man standing there wearing bluejeans.... did he survive also?